Okay – if you want a seriously great dining experience, take the drive to Leonard’s Mill in Second Valley, SA. This food is not only up there with the best I’ve eaten in South Australia, it’s some of the best I’ve had in my travels around the country. Owners Jane Mitchell and Alan Greig have had Leonard’s Mill over four years now, and eighteen months ago they were fortunate enough to secure husband and wife team Brendan Wessels (head chef) and Lindsay Durr (patisserie chef), both formerly from the iconic Lake House in Daylesford. Brendan and Lindsay work closely with local growers and producers to produce food that is both beautiful and faultless. Leonard’s Mill is an impressive stone structure and the property encompasses the bar and restaurant, verandah seating, function spaces and cottage accommodation. Built by the first Government, the mill was sold to James and John Leonard in 1849 and was used to grind grain for flour and then in the later years, wattle bark for tanning leather dye. It’s about a 1.5 hour drive from Adelaide and the route provides for simply spectacular landscape of ocean and rolling green hills. It sits mid-way between McLaren Vale and Cape Jervis. I once drove 3.5 hours from Wahgunyah, Victoria to have dinner in Daylesford at Lake House, so believe me – 1.5 hours of travel is nothing for food like this. Of course, if you’re driving from Adelaide and it’s a dinner, you’ll want to stay overnight, and if they can’t fit you in at the Mill cottages, there’s plenty of other accommodation available down there, including cottages literally staggering distance just across the road. We went on a cold winter’s night and the Mill looked more than inviting from our cottage window. It was nicely lit up and it looked so cosy. We decided to head over a bit earlier than our booking for a drink. We were warmly welcomed by Jane (the hostess with the mostess) and Alan, who are committed to old fashioned hospitality, making you feel like part of the family. We walked straight into the newly renovated bar area and were immediately enveloped by the beautiful warmth emanating from the wood fire. I’m in the mood for a sparkling and Jane suggests a glass of the Mosquito Hill Blanc de Blanc Vintage 2010, (from their “unashamedly parochial” wine list). Good to know too that there’s now a range of bar snacks, including pork scratchings and Thai beef spring rolls, if you’re simply after a drop-in drink rather than dinner. I’m impressed with the menus – not simply because of the dishes on them, but also because of the choices you have. There’s the Miller’s menu, which consists of a few more hearty, rustic dishes, and then there’s the ‘A Taste of the Fleurieu’ from which you can choose two or three courses, or a six course degustation with or without matching wines. We decide to go the six courses without matched wines as we’ve brought our own special bottle of red with us, and corkage is only $18 per bottle. First up, a couple of snacks and housemade breads. Before we get onto our red, we decide on a glass of white each, and how can you go past a Shaw and Smith M3 Chardonnay? Nice! The first course comes: Beetroot and buffalo curd, rye and hibiscus. Now this is something I wouldn’t normally order but, my goodness – it looked and tasted incredible! Various shades of red on a plate combined with white curd – a zingy combination of smoked and pickled textures and tastes. My tastebuds were well and truly alive. 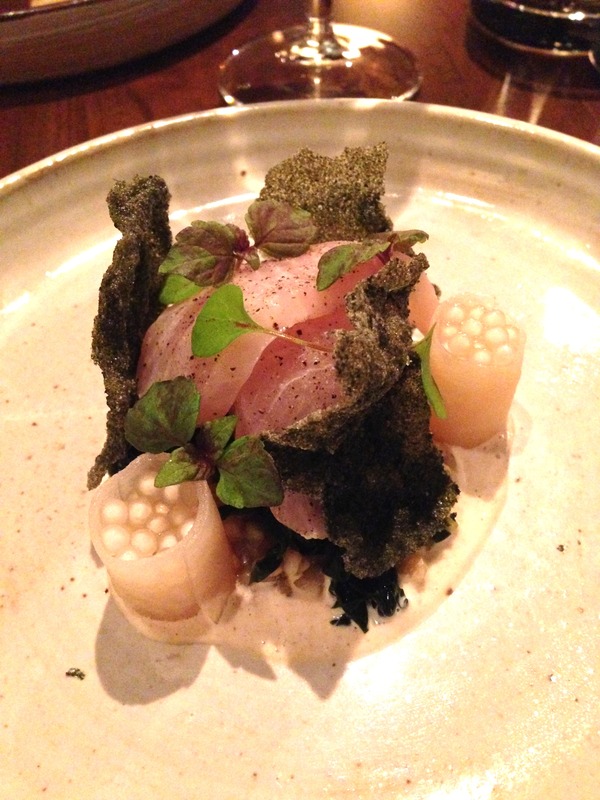 Next, the Smoked kingfish sashimi, chargrilled octopus, dashi pearls, daikin and yuzu. Once again, stunning presentation. Beautiful fresh flavours – salty nori crisps combined with the lightly smoked fish and melt-in-your-mouth octopus on buckwheat and avocado. Following this was the Boer goat in brik pastry, date, smoked yoghurt, and bulgar wheat salad. A great contrast to the previous course – tasty goat meat wrapped in crispy pastry combined well with the sweetness of the smear of date. And just when you think it couldn’t get any better, out comes…. the lamb! The Kangaroo Island lamb neck, charred shallots, apple and sheep labneh. This dish is crazy-good! So full of flavour and the lamb just melted in our mouths. I am sitting on 11 out of 10 on the ‘happy-ometer’! We got to try all 3 dessert courses and they were excellent! Dessert freaks rejoice! My sweet-toothed partner absolutely loved them. And the local artisanal cheeses were great to finish on – my favourite being the creamy blue from Paris Creek. In summary, great people, great service, fantastic food. Leonard’s Mill is simply brilliant! Make a day and/or night of it and book in soon!